PT Bank Negara Indonesia (Persero) Tbk - BNI or referred to as "Bank BNI" is a trusted and reliable Indonesian public-listed bank which is majority owned by the Government of Indonesia. 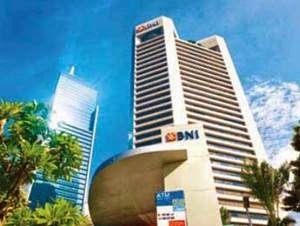 Bank BNI — whose shares are traded on the stock exchange/IDX under the code BBNI — is 60% owned by the Government of Indonesia and 40% by general public and investors (11.29% by domestic investors and 29.71% by foreign investors). Bank BNI is based in Jakarta and has its business activities focused in personal banking, priority banking, business banking, international and treasury. Operations are supported by a total of more than 1,775 domestic outlets and 6 overseas offices located at Singapore, Hong Kong, Tokyo, Osaka, London, and New York. During the third quarter of 2015 (3Q-2015, ended in 30 September 2015), Bank BNI achieved strong growth in total assets of 11.9% to Rp456,463 billion over the same period at previous year (Rp408,047 billion in 3Q-2014). Total loan in 3Q-2015 continue to grow by 14.6% year on year (YOY) to Rp307,122 billion from Rp267,942 billion in 3Q-2014, according to Bank BNI's Public Expose Financial Performance the third quarter of 2015 as cited by JobsCDC.com. Graduated from S1 or S2 from a leding university, majoring in the following discipline : Computer Engineering, Electro Engineering, Statistics, Electronics, Computer Science, Informatics Engineering, Information Systems, Industrial Engineering, Physics Engineering, and Mathematics. GPA min. 2.75 (for S1 PTN) or 3.00 (S1 PTS) and 3.25 (for S2) within 4.00 scales. Maximum age 26 years old (S1) and 28 years old (S2). Language Proficiency in English (at least passive). UNIX (AIX, Solaris, Linux), TACL, SAS, SQL PL. Preferably have experience in programming (value added). Preferably mastering in Development Tools, Database Management, Oracle / SQL, Project Management Tools, Unix. Good knowledge about the of IT Project Management, IT Architecture Banking, IT Procurement, IT Systems and Procedures, Operational Support IT. Preferably have experience in related field (value added). Preferably have experience in the field of operating systems / database / network / Internet / VOIP and desktop (value added). Mastering Platform UNIX (IBM AIX, Oracle Solaris, Linux) / Microsoft Windows Server / Database Oracle / MS SQL / internet concept (dns, email and proxy) / Concept VOIP / PBX and the concept of TCP / IP. Possess certification in CCNA / MCITP / Oracle Database Admin / SQL Server is an advantage. Have experience in managing security information, develop information security policies, IT Assessment and Penetration Testing, design implementation measures of information security, run IT Security Governance. Deeply interesting in information security, hacking, and explore the data packet and security devices (IPS, Firewall, etc.). Preferably have experience in the field of kernel debugging or Compile the Linux kernel, the configuration of network / security, shell command / unix administration, perl / php / lua / python. JobsCDC.com now available on android device. Download now on Google Play here. Please be aware of recruitment fraud. The entire stage of this selection process is free of charge. PT Bank Negara Indonesia (Persero) Tbk - S1, S2 Officer Development Program BNI February 2016 will never ask for fees or upfront payments for any purposes during the recruitment process such as transportation and accommodation.